Who needs fast food? Try Maggie’s breakfast sandwich! 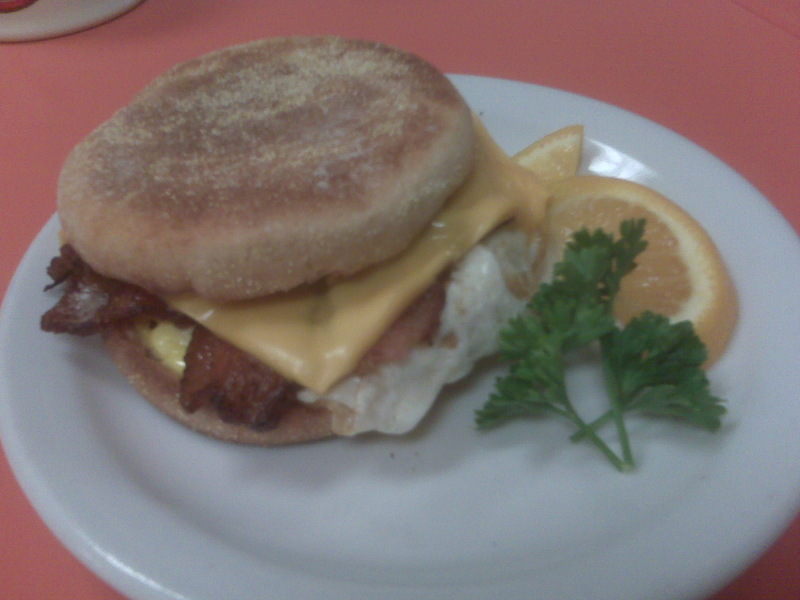 One of Sean’s many specialties, our breakfast sandwich is a customer favorite. Served on a grilled English muffin with egg, cheese and your choice of sausage, ham or bacon, this is a people pleaser. Priced under $4, you can’t lose with this tasty treat to start your day! This entry was posted on Tuesday, October 27th, 2009 at 5:48 AM and is filed under Breakfast. Tagged: bacon, breakfast sandwich, egg, english muffin, ham, sausage. You can feed this entry. You can leave a response, or trackback from your own site. « Maggie’s downtown diner style – simple but delicious!